Oi, a kale Reuben! 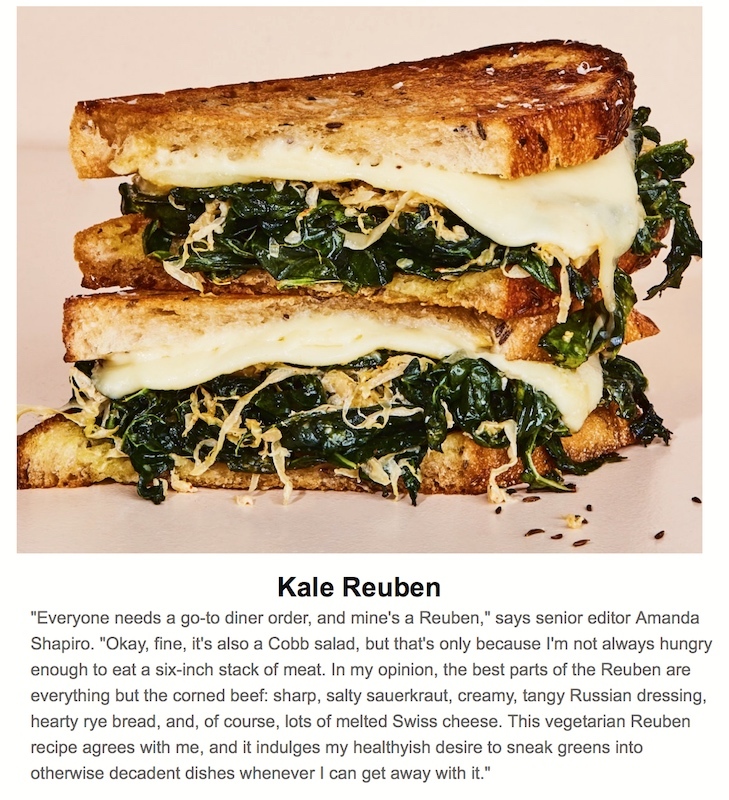 Howls of outrage from readers who have no quarrel with Shapiro’s desire for a grilled sautéed-kale sandwich, possibly one distantly evoking the Reuben sandwich — but who draw the line at calling the thing a Reuben, Reubens for them (and I am one of them) being by definition a kind of corned beef sandwich (with characteristic accompaniments, and very similar to the Rachel, its pastrami sister sandwich; see my 3/27/15 posting “Reuben and Rachel”). Shapiro appears to be taking kale Reuben to be a subsective compound: a kale Reuben is a Reuben. In my view, kale Reuben must be understood as merely resembloid, only metphorically a Reuben. Now, I have no objections at all to resembloid compounds, any more than I object to metaphorical language (whether created on the spot or conventionalized) in general. I will happily defend many resembloids that some people object to: X lasagna naming layered desserts, as in chocolate lasagna; tofu meatballs, vegetable sausages, etc. ; almond milk, soy milk, etc. In all of these, the meaning of N1 in the compound effectively guarantees that N2 will not be taken literally. In many other cases, you just have to learn that some compounds are resembloid — that a Rocky Mountain oyster isn’t an oyster (though Rocky Mountain fever is a fever), that a Boston marriage isn’t a marriage (though a Boston accent is an accent), that a California lilac isn’t a lilac (though a California poppy is a poppy), and so on. However, barring a tell-tale N1 or experience with the meaning of a specifc compound, the default is for N1 + N2 compounds to be understand subsectively. (Subsectivity isn’t the law, but it is a rule of thumb.) So when you come across kale Reuben for the first time (as I did yesterday), you’ll probably assume that it’s a kind of Reuben — perhaps an ordinary Reuben with some chopped kale added to the sauerkraut. (Come to think of it, that’s not at all a bad idea.) But there will be significant corned beef — maybe, imaginably, another sliced brined meat, like pastrami, but certainly such a meat as the main act. Your prototypical Reuben has six components: it’s (1) a grilled (2) sandwich, (3) on rye bread, with (4) corned beef as the principal ingredient, accompanied by (5) sauerkraut and (6) Russian dressing. Chris Morocco, who tackles all my half-baked recipe ideas with aplomb, decided to use kale in place of the meat, but any sturdy green is fair game. The greens get lightly sautéed with garlic then mixed with sauerkraut and Morocco’s shockingly delicious take on Russian dressing, which is just full-fat Greek yogurt and hot sauce. 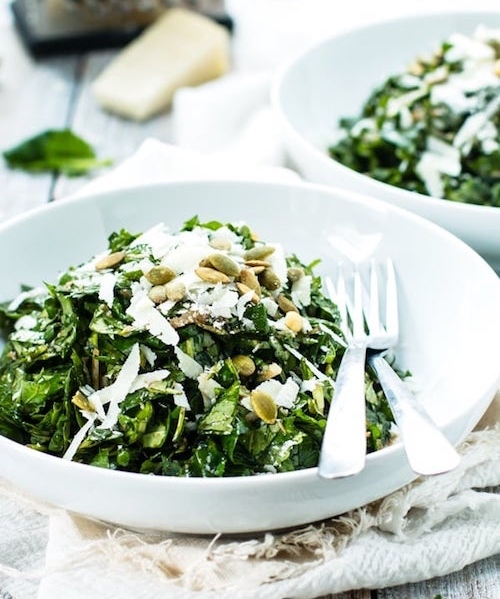 The kale mixture goes on your bread of choice (no, you don’t have to go with rye) with a couple slices of Swiss, and, well, you know how to make grilled cheese—just be sure to butter the outsides of the bread first so your sandwiches can achieve melty, toasty perfection. Quick version of the recipe: kale, center ribs and stems removed, leaves coarsely torn; lightly brown garlic in olive oil, sauté the kale in it; add sauerkraut, Greek yogurt, hot sauce, salt; put this on slices of rye (or whole wheat) bread, top with slices of Swiss cheese and grated Parmesan; add top slices of bread, brush with butter, and pan-brown the sandwiches. This jettisons the kale, allows whole wheat bread to be substituted for the rye bread, and replaces the Russian dressing with that yogurt-hot sauce concoction. A grilled sautéed-kale and sauerkraut sandwich , with some cheese. A kalekraut sandwich, or kalekrautwich, vaguely reminiscent of a Reuben, but not actually one. But the status of labels isn’t fixed forever. If kalekrautwiches get to be a thing, then at least some people might think of them as having expanded the REUBEN food category, the extension of the label Reuben. Then kale Reuben will have become subsective for these speakers. I wondered if FCWB was a subsective compound — did this thing count as an instance of a Benedict, that is, as eggs Benedict? — or was its name resembloid, the dish merely (metaphorically) Benedict-like? … My immediate judgment was clear: for me, FCWBs are just too far from the BENEDICT category: the waffle too distant from an English muffin, the fried chicken too distant from a slice of ham, and anyway the thing came with maple syrup, as (soul-food) chicken waffles do, and sweet Benedicts are way over the line for me. But I had to recognize that it seems that for some people FCWBs are a thing — for them, just another kind of Benedict, so FCWB is, in their minds, subsective. Reubens and Cales. Aside from its culinary and linguistic interest, the expression kale Reuben caught my ear because it sounded like a proper name: Cale Reuben, and maybe Reuben Cale as well. Reuben has its origin in the name of a Hebrew patriarch, eldest son of Jacob and Leah, and of the tribe of Israel traditionally descended from him (NOAD, lightly edited), so it’s used as a surname or a personal name, etymologically conveying that its bearer is of the tribe of Reuben. while other sources take it to be a variant of Cahill, derived from the Gaelic personal name Cathal. In any case, both a surname and a male given name; some notable people named Cale are listed in a Wikipedia entry. On to a search for Cale Reuben and Reuben Cale. Nothing at all recent came up. But some nice finds from the 19th century, in the East Midlands of England. Cale Reuben. From the History, Topography, and Directory of Northamptonshire, by Francis Whellan & Co. (1874), in its enumeration of the residents of the Orlingbury Hundred: one Cale Reuben, a schoolmaster. Orlingbury is a village and civil parish in the English county of Northamptonshire. 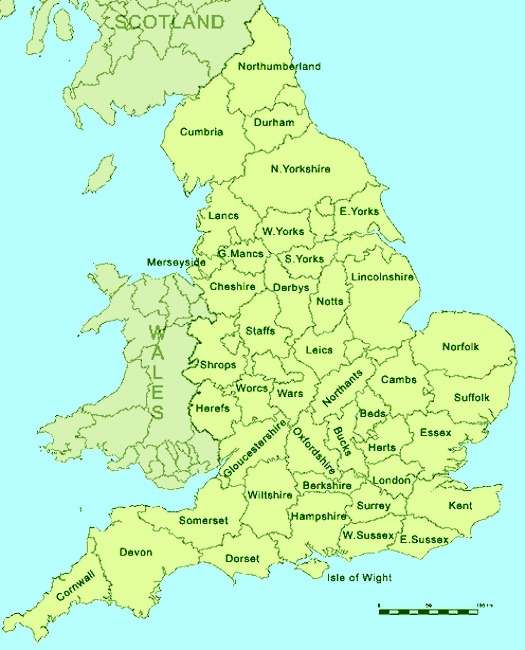 It is between the towns of Kettering and Wellingborough. Administratively it forms part of the borough of Wellingborough. At the time of the 2011 census, the parish’s population was 439 people. Near to Orlinbury in the Orlingbury Hundred: Harrowden, Great Harrowden, Hardwick, and Pytchley. Further out lie Leicester, Peterborough, and Northampton. Still further: Orlinbury lies between Birmingham and Coventry on the west and Cambridge on the east. Amongst many villages and small towns. Hucknall, formerly Hucknall Torkard, is an English town in the district of Ashfield, Nottinghamshire [7 miles northwest of Nottingham]. It was historically a centre for framework knitting and then for mining, but is now a focus for other industries and a dormitory town for Nottingham [with a population in the 2011 census of 32,107]. It was the site where Rolls-Royce made the first demonstration of a vertical take-off plane. It is also the final resting place of Lord Byron in 1824 and of his estranged daughter, the mathematician and pioneer computer programmer Ada Lovelace in 1852. This entry was posted on March 22, 2019 at 12:01 pm and is filed under Categorization and Labeling, Language and food, Names, Semantics, Subsectivity. You can follow any responses to this entry through the RSS 2.0 feed. You can leave a response, or trackback from your own site. I don’t think I’ve ever heard “foodstuff” used in the singular before. Interesting. Not only is is a singular count N, it looks like the best choice in the context: food is too general, and dish strikes me as very odd for a sandwich (possibly because a dish is usually one part of a meal). Also, my middle name is Reuven. I have no strong (terminological) objection to such things as “turkey Reuben”, but kale might be a bridge too far. I’m uncertain about the various kinds of lasagna you refer to, but don’t get me started on the widespread abuse of the word martini.